In a controversial decision, the Centre tonight notified amendments in the Capital’s Master Plan 2001 allowing commercial activities to run in residential areas, bringing relief to small shopkeepers gripped by anxiety in the wake of a Supreme Court directive. In an attempt to rein in schools that fail to meet the mandatory requirements for teaching of certain subjects, the Central Board of Secondary Education (CBSE) has issued a notification urging affiliated schools to fall in line or face the music. Senior police officers reportedly refrained from issuing orders to the Noida cops for taking tough measures under political pressure to deal with the situation in Rajat Vihar which was attacked by violent crowds from Ghaziabad’s Khora Colony yesterday. Meanwhile, the police were at the receiving end. The Mewat police claimed to have busted an inter-state gang of auto thieves who were operating in Uttar Pradesh, Delhi, Rajasthan and Haryana. The Superintendent of Police, Mewat, Mr H. S. Doon, said the police arrested five persons and recovered one Maruti Zen, three motorcycles, two countrymade pistols and other weapons from their possession after conducting a raid at an isolated house last night. The police have solved a number of vehicle theft cases with their arrest. The Noida police have busted an illegal telephone exchange being run in Sector 11. The police, which had acted on a complaint by Reliance Infocomm, also nabbed three persons running the illegal exchange and seized a large number of Reliance mobile phones, a computer and other equipment. The brick kiln may be a useful thing when it comes to construction work, but their large number could turn them into a blot on the land as a brick kiln could have major side-effects like damaging the overall fertility of the land and disturbing the ecology of an area through acute pollution. Irked over the non-examination of prosecution witnesses in an eight-year-old power pilferage case, a Delhi court has ordered the CMD of NDPL, a private power distribution company, and Delhi Police Commissioner to file reports and ensure the appearance of witnesses. The CBI today filed separate chargesheets against eight people in the Rs 4,000 crore Co-operative Group Housing Societies scam including former Registrar of Co-operative Societies (RCS) Narayan Diwakar, the alleged mastermind. Refusal to exchange defective sarees by an apparel shop in Connaught Place proved costly for it when a city consumer court directed the shopkeeper to pay the victim Rs 15, 000 as compensation, including the litigation cost. In a bid to do away with misconceptions and superstitions related to solar eclipse, special arrangements are being made to make students view the celestial spectacle tomorrow in schools across the Capital and neighbouring areas. At a time when East Delhi is being upgraded for the Commonwealth Games 2010, it is strange that a village, Shakarpur Khas, with a population of more than three thousand, located very close to the proposed Khel Gaon site, is deprived of even basic amenities like regular electricity, water and sewer connections. There is panic among students and employees of 26 B.Ed colleges after their affiliation with the Chaudhary Charan University, Meerut, has been ended. Many of these colleges are located in Meerut, Ghaziabad and Gautam Budh Nagar. Thousands of lawyers practising in the Delhi High Court and three district courts today struck work and refrained from appearing before the judges, expressing solidarity with the striking advocates of the Tis Hazari district court. Two brothers, Mohd Umar and Mohamed, were sentenced to 10-year jail each for printing fake currency by Judge Shiv Prasad’s court here yesterday. According to Additional District Public Prosecutor Verinder Singh Yadav, the two accused have also been fined Rs 20,000 each. In case of non-payment of fine, they will have to undergo six months’ additional jail term. A youth, who allegedly stabbed his ex-fiancee several times after their marriage was called off, was today remanded to judicial custody till April 10. Members of the Anjuman-e-Islahul Musilmeen staged a rally last week in front of the camp office of the District Magistrate and the Noida Authority in support of their five demands, which included land for a graveyard. The old graveyard land had been taken over by Appu Ghar. Six Bangladeshi nationals allegedly involved in several cases of robbery in the capital were arrested from south Delhi’s Sarita Vihar area, police said today. Two labourers died after being electrocuted here on Monday at Azadpur railway station in North-West Delhi, the police said. The two unidentified men were electrocuted while unloading sacks of onions from a wagon at the railway station. “The notification is aimed at helping small traders as the Supreme Court has also directed that major and minor violators should be segregated. The decision has been taken in that spirit,” Minister of State for Urban Development Ajay Maken told reporters. “The decision is according to law and has been taken after considering all legal aspects,” he said. The new policy would legalise commercial activities on the ground floor of residential premises on as many as 118 roads in the Capital. The notification comes in the wake of Supreme Court’s direction to MCD to close down commercial establishments operating out of residential premises and also amidst stiff opposition from various Resident Welfare Associations (RWAs) across the Capital. The RWAs are opposed to allowing commercial activities in residential areas as they feel this would put undue strain on the infrastructure, including water, power, parking facilities etc, of such colonies. Asked about the opposition from RWAs to the move, Maken gave the assurance that they should not panic. He said the decision would provide relief to thousands of small shopkeepers operating from the ground floor of residential premises. Maken also said the MCD Commissioner has been informed about the decision and a copy of the notification has been despatched to him. The Board has specifically asked schools offering Physical Education as one of the Elective Subjects at the Senior Secondary level to ensure that they meet the norms prescribed. A notification that has been sent out to schools reads, “Schools are granted affiliation to this subject after the fulfilment of certain conditions, which include the availability of playground and other teaching facilities. It is also imperative that the schools should have a fully qualified teacher with Master’s Degree in Physical Education in order to teach the subject”. The order comes in the wake of information to the CBSE about schools flouting norms by providing students the option of taking Physical Education even as they fail to provide the essential requirements. “ It is important that the students who opt for this subject should be able to enhance their competence and aptitude in sports and games. Further, this should help in improving their fitness levels for participation and performance in various activities,” the Board notes. Reminding the schools to do the needful, the Board has specified that, “no school, which does not have a fully qualified teacher in the said subject is entitled to have affiliation for the subject at the Senior Secondary level”. Further, schools offering Physical Education as an Elective Subject at Senior Secondary Level should have at least a 200 meters track and free space, sufficient to create a basketball /volleyball /handball /kho kho court, provide adequate thrust and emphasis in realising the curricular objectives of the subject and shall provide adequate support mechanisms in terms of equipment for effective transaction. Warning of stern consequences, the note reads, “any non-compliance of the basic requirements for teaching this subject would attract the provisions of the affiliation bylaws for withdrawal of permission for teaching this subject at the Senior Secondary level”. Education at the Middle and Secondary School level to improve general fitness level of the students,” the Board has recommended identification and nurturing talents in sports to enable them to participate in sports events at various levels. Meanwhile, the Board has announced that candidates whose answer scripts got destroyed in the fire that broke out in a school on March 23 can either opt to take a re-examination or can have marks allotted on the basis of their performance in the rest of the three papers. Nearly 2,500 answer scripts of a batch of students who had taken their Science and Technology examination conducted by the CBSE were destroyed in the fire that broke out in Ludlow Castle Number 1. The fire was reportedly caused by a short circuit. “We have given the students the option of choosing between a re-examination and getting their marks allotted on the basis of their performance in the rest of the three subjects,” the CBSE PRO Ms Rama Sharma said. She added, “The ultimate aim of CBSE is to provide benefit to students, therefore the board has decided that if the students who take a re-examination score less marks in the subject than the rest of the three, then we will work out the marks based on the other three subjects and allot the marks for the Science and Technology paper. The students will be benefit in either case,” she said. The re-examination will be held on April 8 and a notification regarding the same is being sent out to individual schools. “The schools will be notified by March 29 about students whose answer scripts were destroyed. Students can then decided what option they want to go with. The roll numbers, admit cards and even the examination centre for the April 8 examination will remain the same,” Ms Sharma said. Not only that, the rowdies had barged into houses and flats and torched them along with vehicles. Certain residents had run away in fear for their lives. A few, including women, had jumped from the first floor to escape the mayhem. According to eyewitnesses, it was reminiscent of the Hero Honda factory workers’ clash with the police and the Dadri railway station violence last year and on Saturday, respectively. Observers feel that lately a very unfortunate tendency among masses for violence is being witnessed increasingly. In the whole incident, observers felt it was the fault of the Noida Authority. On March 5, the Noida Authority with the help of the Noida police had started repairing the wall between Khora and Rajat Vihar in keeping with the high court orders. But as Khora residents started a demonstration at Vigyan Thapar Gate, the Noida officials and police had to retrace their steps. People in Rajat Vihar had again gone to the court, saying that the police were guilty of contempt of court for not having carried out the court orders. The police, on their part, had asked for a bigger force in view of local intelligence reports that they might encounter heavy violence from Khora side. After a second reprimand by the high court, the Noida Authority decided to repair the wall with police help. Armed with huge iron sheets, the police and Noida Authority officials reached the Khora-Rajat Vihar border yesterday. But the police once again had to face stiff resistance. The Noida police are also livid at the role of the Ghaziabad police as Khora Colony is part of Ghaziabad district and had the Ghaziabad police reached in time things wouldn’t have gone out of hand to the extent they did. A two-judge Bench of the Allahabad High Court, comprising Mr Justice B. S. Chauhan and Mr Justice Shishir Kumar, had ordered the construction of a wall on September 30, 2005. But it was taken rather causally by the Noida Authority. The arrested culprits have been identified as Imran, Shahid, Aash Mommhmed and Jakhir from Mewat district while the fifth accused, Vinod, belongs to Jaipur. Imran was the mastermind of the gang, added the police officer. Mr Doon informed that Imran and Shahid had confessed before the police that they had stolen a Maruti Zen from Tilak Nagar in Delhi last week. Imran and Jakhir had stolen a motorcycle from the Ashram crossing at Delhi one month back. Imran and Shahid stole an Indica car from a marriage party in Gurgaon and another car from Vrindavan. They sold both the vehicles to Ashok Kumar, a resident of Bulandshahr, Uttar Pradesh, for Rs 50,000 each. Imran and Shahid also allegedly stole another car from Aligarh and sold it to Khurshid for just Rs 20,000. The duo also stole a Baleno from the residence of an MLA in Mathura and sold it for Rs 2 lakh to a resident of Punhana, Mewat, informed the SP. Imran and Aash Mommhmed stole two motorcycles from Aligarh and sold these vehicles to a resident of Hathin for Rs 3,500 each. 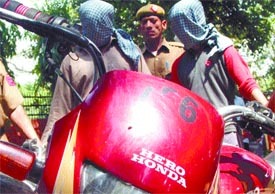 Imran and Jakhir had also stolen two motorcycles from Agra around two months back and sold them for Rs 5,000 each. Mr Doon further informed that this gang of professional vehicle thieves might be found involved in more theft cases. Officials of the risk containment unit of Reliance Infocomm had informed that house no H-61 in Sector 11 was being used as a fake and illegal Reliance telephone exchange. SSP Piyush Mordia said when the police team raided the house, they found a complete network similar to a telephone exchange functioning from it. The police arrested Prashant Thomas, alias Shankar, Devinder Singh and Abhijit and seized 19 Reliance mobile sets, one computer, CPU, data cable and other equipment. Prashant told the police that they had opened this exchange in Noida on the advice of Lizu Mathew of Elega Enterprises of Bangalore. The police said these people used to convert an international call into a local call for their clients. This way they used to fleece the Videsh Sanchar Nigam of crores of rupees of revenue by converting all international calls into local calls through the Internet medium. The police have informed the Karnataka police about Lizu Mathew running an illegal telephone exchange there. The police said Prashant was from Kerala. He had come into contact with Lizu Mathew in Bangalore. He had qualified in a 14-month computer hardware diploma from Jet King. Door Sanchar officials have also interrogated the arrested criminals. A case under the IT Act has been registered against the accused. The police have sought help from Reliance and Door Sanchar officials in the matter. The existence of around 182 brick kilns has been a cause of concern for residents of the district. Expressing concern over the failure of the authorities to limit the number of brick kilns in the district, prominent Congress party leader and former MLA Rajender Singh Bisla has said it is a matter of grave concern that a large number of brick kilns have come up in the adjoining areas of the city and the district after a ban was imposed on such structures in certain parts of the neighboring districts of UP a few years ago. In areas where there was acute shortage of sweet underground water, brick kilns consume a large amount of water, besides damaging the upper crust of fertile land between five and eight feet, rendering it useless. A recent survey of the area found that many farmers in the nearby villages were engaged in leasing out agricultural land for such purposes on the assumption that their land could be acquired by the government. Mr Bisla said the reports revealed a large number of brick kilns had come up in the adjoining areas, especially in Hodal and Ballabgarh subdivisions in the recent past. It was claimed that about 50 brick kilns in Agra district of UP were shut down following court orders due to the threat of pollution. Some of these had reportedly shifted to Hodal subdivision. According to experts, there could be several fallouts of the presence of a brick kiln in an area. These included pollution, loss of fertility of the land, damage to the underground water level and loss to overall agricultural production. It was stated that there could be no diversification of farming in such an area and the land could not be used till it was filled up again, which required lots of funds and effort. Reportedly, the level of underground water, which had been 40 to 50 feet a few years ago, had gone down to 100 feet or more in a majority of the areas, leading to depletion of the sweet water resources. Faridabad is one of those districts where the availability of sweet water is very low. A majority of the densely populated colonies in the city face an acute water shortage throughout the year. Though the setting up of brick kilns requires permission from the Pollution Control Department and certain norms are required to be followed, it is alleged that rules get circumvented due to corruption and pollution was still a major problem. “Prosecution has almost converted into persecution and the court is feeling powerless in ensuring the obedience of its orders,” said Matropolitan Magistrate Sanjay Sharma. “Let the copy of this order to be sent to the CMD, NDPL as well as Commissioner of Police with a direction to file compliance report and to ensure the presence of witnesses on March, 30, the next date of hearing,” the judge said. Referring to the non-examination of witnesses in a power pilferage case in which an octogenarian Mulkraj Anand is facing trial, the court said, “Matter deserves prompt disposal but owing to the non co-operation of NDPL and concerned police station no material witnesses have been examined”. Mulkraj was allegedly caught pilferaging electricity at his premises at Samai Pur Badali by a team of erstwhile DVB in 1988. But, after the takeover of the DVB by the NDPL, the former has not produced witnesses in the court for examination. Meanwhile, the court also issued warrants against a witness who did not appear before it despite receiving the summons. The two chargesheets were filed in the courts of Special Judge S K Kaushik and Special Judge Kamini Lau, against the then Assistant Registrar D N Sharma, Inspectors Ram Nath and Faiz Mohammed, builder Shri Chand and three others Anna Wankhede, S P Saxena and Ashok Goswami as accused in connection with the Taj and Anjuman CGHS. The accused, presently in judicial custody, have been chargesheeted under various sections of Indian Penal Code and Prevention of Corruption Act. The chargesheet comes less than sixty days after Diwakar surrendered before the court on January 30, which will not allow him to get statutory bail in this case. Special Judge S K Kaushik today took cognizance of the chargesheet in the Taj CGHS case, and issued production warrants against former RCS officials, Shri Chand and Wankhede for April 4. According to the chargesheet, Diwakar, in a criminal conspiracy with the other five, fraudulently and dishonestly revived the defunct Taj CGHS on the basis of bogus and fake documents “with the sole intention to get land allotted from DDA at a cheaper rate”. Jai Prakash bought three sarees for his son’s wedding from M/s Greenways. When he came home, he found the sarees defective. When Jai Prakash went to exchange them, however, the shopkeeper refused, forcing the buyer to knock at the door of the Consumer Court. The Delhi State Consumer Disputes Redressal Commission Bench presided over by Justice J D Kapoor and Member Rumnita Mittal asked the showroom to pay the stipulated amount within a month to Jai Prakash. The order came on an appeal filed by the shop, against which a District Consumer Forum has earlier passed the verdict ordering payment of Rs 25,000 as compensation after it was held guilty of “deficiency of service”. The Commission, however, partly allowed the appeal and decreased the amount by Rs 10,000. As per the complaint filed before the District Forum, Jai Prakash, on the eve of his son’s marriage in the year 2002, had purchased 21 sarees worth Rs 70,320. Out of the bought stock, the complainant found three sarees defective, but the shop refused to exchange them. The Forum passed an ex-parte decree against the shop, which did not appear before it during the proceedings. Subsequently, the shop issued a credit note of Rs 11,500 in favour of the complainant and also approached this Commission which reduced the amount on the ground that the defective sarees were not returned to the appellant. Being organised by SPACE, an NGO, and amateur astronomers ‘Heli Odyssey 2006’ it also has the objective of spreading scientific temper among the society at large and the student community in particular. The students along with their parents and teachers would be able to view the eclipse on a mega level through solar filters, pin hole projections, optical projection through telescope and video photography, where the live image of the sun is projected on a large screen through an LCD projector using video camera and computers. A total of 40 schools in Delhi and NCR have been selected for conducting the viewing of the solar eclipse, a release said here today. The eclipse will be visible in India partially from certain areas. It will be visible in the country as partial eclipse from areas covering North-Eastern region, Northern as well as Central India and North-Western parts of the country, an official release today said. The eclipse begins in Kolkata at 17:02 hrs and ends at 17:45 hrs, in Lucknow it starts at 16:41 hrs and ends at 17:58 hrs, Patna - 16:49 hrs and 17:56 hrs, Raipur - 17:05 hrs and 17:35 hrs, Ranchi - 16:56 hrs and 17:48 hrs and Srinagar 16:21 hrs and 18:10 hrs. “In the maze of over commercialisation, the original Shakarpur Khas village has been covered under the shadow of encroachers and building mafias,” he said. He said prior to 1965, the whole village area was covered with greenery. Now, due to commercialisation only few thousands original villagers reside in the area, he added. According to the president of the ‘Bharastachar Nirodhak Morcha’, Mr Narendra Kumar Singh, the condition of old residents of this village is so deplorable that they are unable to renovate their houses and chopals. Some villagers are still dependent on small farming like cropping up of fruits and vegetables near the green belt of Yamuna Pustha and near Bhairo Ghat. They are forced to drink dirty water supplied through the pipeline from the Yamuna Pustha-based rainy well. The whole area of this village has been declared as unauthorised by the Delhi Government. According to sources, among the colleges adversely affected are R.G. Degree College, Meerut, Dewan Institute of Management Studies, Partapur, Sia Ram Kasturi Devi College of Education Meerut, Meerut College of Advance Technology, Inter Dev Institute of Education, Bhagpat. In Gautam Budh Nagar, Ram Devi Kanya College, Noida, Harward Institute of Management Technology, Greater Noida, Rama Institute of Education, Greater Noida, Galghoutiya College of Engineering Technology, Greater Noida, Cosmos College of Education, Noida are among those affected by the latest turn of events. Besides, New Era College, Science and Technology, Ghaziabad, Shiv Institute of Management, Ghaziabad, Tej Ram College of Education, Ghaziabad are also among those institutes which have lost their affiliation. The judges and court officials came to the courts, but the advocates did not appear for the clients. Except some urgent criminal cases, no proceedings were carried out in the High Court and District Courts. A section of the lawyers are on strike since January 2, opposing the creation of a separate court at Rohini in West Delhi shifting some courts from the Tis Hazari district courts. In a resolution, the Tis Hazari Bar Association said the strike would continue till the matter was resolved. The Delhi High Court has declared the strike by a section of lawyers as ‘illegal’, saying that it would not tolerate any hardship to the litigant public. The Loni police had arrested the duo with a printing machine, computers and printing papers. Photographs of Mahatma Gandhi and the Ashoka Pillar were also recovered. The police also recovered 78 fake currency notes of Rs 500, Rs 100 and Rs 50 denominations. 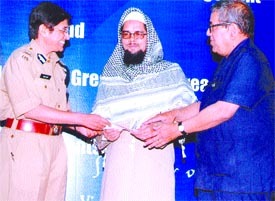 The Loni police, in a raid on March 30, 2004, had arrested the brothers. Metropolitan Magistrate Amit Kumar, after the production of Ajit Singh, sent him to jail as police did not seek his custodial interrogation because he had allegedly confessed his guilt. As per the police, Ajit was enraged after the parents of the victim refused to marry their daughter to him as he was addicted to alcohol. Singh, an auto driver, barged into the house of his ex-fiancee Rashmi in Nand Nagri area of Northwest Delhi yesterday and stabbed her six times injuring her critically. Ajit also allegedly stabbed Rashmi’s sister-in-law twice. Both the injured have been admitted in Guru Tegh Bahadur Hospital. Ajit and Rashmi had got engaged one-and-a-half years ago, but the girl’s father called off the marriage recently. The agitators also demanded land for construction of a mosque, an Urdu school, an idgah and a compound (akhara) for Moharram. After the rally at the District Magistrate’s office in Sector 27 and a gherao of city Magistrate Deep Chand in Sector 19, the procession went towards the Noida Authority office where a memorandum was given to the Chief Executive Officer. Six Bangladeshi nationals allegedly involved in several cases of robbery in the capital were arrested from south Delhi’s Sarita Vihar area, police said today. Those arrested have been identified as Mohd Anwar, Mohd Abbas, Mohd Najrul, Mohd Afjal, Mohd Manik and Mohd Aslam, police said in a release adding three pistols, five catridges and some equipment used to break into houses were recovered from their possession. On specific information, a special police team reached the area last night and asked the criminals who were sitting in a park to surrender. On spotting the police party the criminals opened fire and tried to escape, but they were overpowered and arrested, the release added. The two men accidentally came in contact with a high-tension wire passing above the wagon, the police said. The victims were taken to the Babu Jagjivan Ram Hospital where they were declared brought dead.